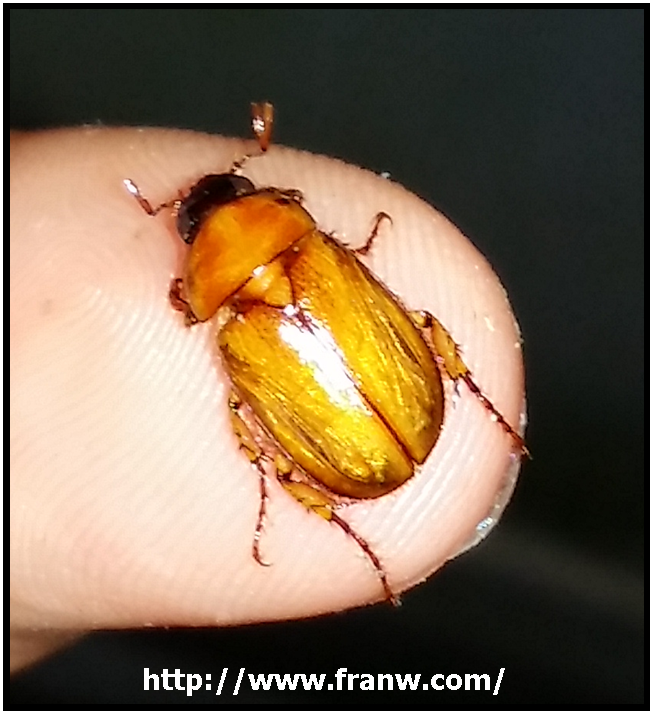 June Bug by Fran W.
What is a June bug? A June bug, sometimes called a May or June beetle, is a type of scarab beetle that can be found all over North America. They can usually be seen swarming lights at night in late May or early June. Look for June bugs around your porch light at night or grab a flashlight and look for them in trees and bushes. Collect a few in a clean jar with holes in the top and use tweezers to examine them gently. Normally these bugs do not bite, so you can pick them up in order to get to know them a little better as well. After studying them for a little while with a magnifying glass, snap a picture, then let them go. During the day, they can often be found walking in grass or dead in a bucket of water, a pool, or pool filter. If you find one, pick it up with tweezers so you can examine it more closely with a magnifying glass. Learn more about June bugs by reading and watching the information offered below. Find out what they eat, how they develop, how long they live, where they can be found, and what sounds they make. Observe how a June bug acts and what it looks like. Identify some of the other bugs and animals that are out at night in addition to the June bug. Start a collection if you find dead bugs. Draw a picture of a June bug and where you found or saw it. Bug Facts: June Bug – Information about where June bugs can be found, what they eat, look like, and their stages of development.